Hebrews 10:25 Let us not give up meeting together, as some are in the habit of doing, but let us encourage one another-- and all the more as you see the Day approaching. The Lutheran church is a liturgical church. Lutherans believe that the gospel is not only the good news that Jesus has saved sinners, but also a power God uses to create and strengthen faith in Jesus. Lutheran worship places the gospel in central focus in an order of service called the liturgy. In message and meal (Holy Communion), in specially selected Bible readings, and in carefully crafted songs, prayers, and confessions, the liturgy points to Jesus as the Savior of all. Small groups, duets and the children of Trinity School will often sing during our worship services. 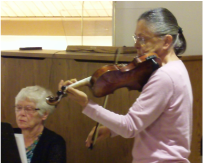 Instrumentalists and accompanists are encouraged to volunteer their talents to accompany our choirs and congregational singing. We are also in need of artistic individuals who can help design, plan and set up seasonal decorations in the sanctuary, fellowship hall and welcome center. 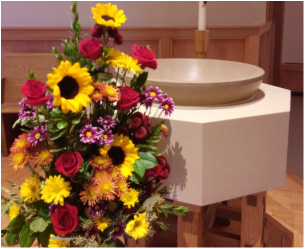 Trinity has an altar guild that sets up communion and makes sure the communion vessels and altar linens are cared for properly. Our ushers and greeters make sure that worshipers are welcomed and have the direction and resources needed to feel comfortable at Trinity. Our audio/visual teams record and make copies of our services for home bound members and internet viewing. We celebrate Holy Communion the first, third and fifth weekend of every month. Wednesday Chapel at 8:15 am during the school year. Did you miss a service? Download this week's service folder and watch the service by clicking here. We believe that God comes to us with forgiveness in very tangible means as we participate in Holy Communion. Because the Bible has convinced us that Jesus’ body and blood are present in the Lord’s Supper, and that receiving this sacrament together is a public statement of complete oneness in our beliefs and commitment, we invite to the Lord’s Supper members of Trinity and guests from sister congregations of the WELS (Wisconsin Evangelical Lutheran Synod) and the ELS (Evangelical Lutheran Synod). 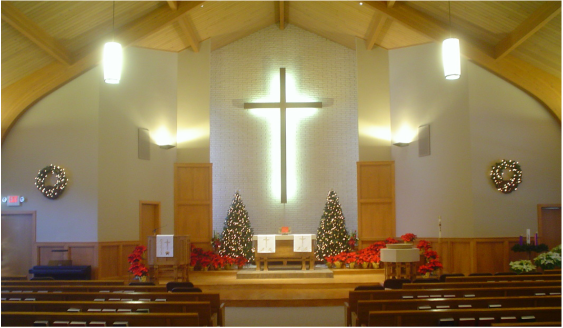 If you are a member of another Lutheran denomination or another Christian church and would like to commune with us, please contact our pastor and he would be delighted to explain what that entails. We don’t want to be presumptuous and put you in the position of stating your agreement with our convictions before we have had an opportunity to explain them. We do look forward to any opportunity to discuss the Christian faith with you.